These Bedding Disposal Stations protect the operator from airborne particulates generated during bedding disposal. The Stations provide a convenient, mobile system for disposing of used bedding from small animal cages. Only three-feet wide, these enclosures fit easily in cramped spaces. The spacious access opening allows free range of motion and the large receptacle accommodates large rat or hamster cages as well as smaller mouse cages. 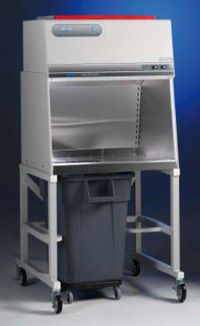 The large waste container holds 151 liter standard-size liners for less frequent disposal. A platform on casters locks securely to the waste container for easy transport. Download more detailed information here.